'WHAT THE KLANG?' Hey, who the heck invited these guys to HARBINGER WARS 2? With HARBINGER WARS 2 seizing America, Livewire has rendered the nation's power grid useless in a last-ditch attempt to shield her psiot allies. The people of Washington D.C. need someone to save them - and so do Quantum and Woody! Now that the high-tech wristbands that keep their atoms stabilized have become nothing more than fashion accessories, the world's worst superhero team is going where no one has gone before... Into the atomic realm! 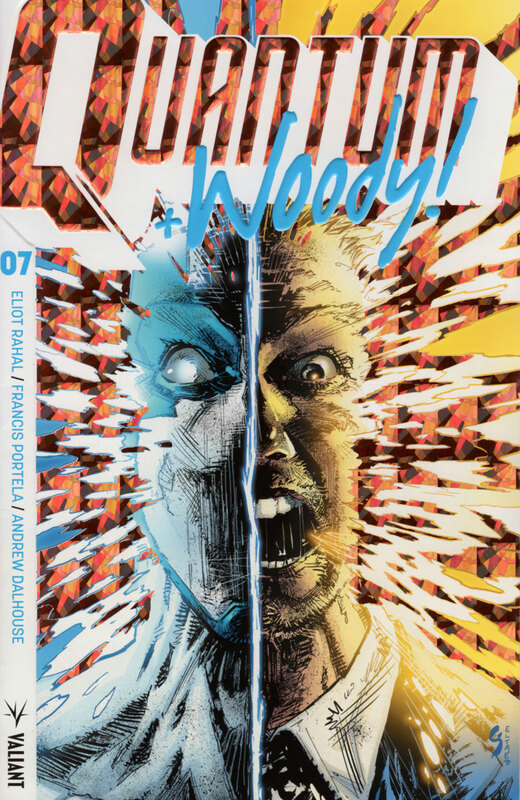 Do not attempt to adjust your eyeballs because red-hot rising star Eliot Rahal (The Paybacks) and fan-favorite artist Francis Portela (FAITH) are taking things from zero to Dada as Quantum and Woody tie into, outside of, and in between Valiant's seismic summer event!